After the success of our Gigantes Trip, we went for lunch right at Tagbac Terminal together with Flo and Lea. I remember my wife asked for patis (fish sauce) but they gave us toyo (soy sauce), we said it’s soy sauce but they insisted it’s fish sauce. Oh my! Really?! It was really funny I even said to the woman “may toyo ka ba?” of course it’s a joke but I don’t think she got it. Not sure if she got offended but she didn’t react at all. Maybe they don’t have patis that’s why. Since it’s four of us this time, we took a cab going to the port right after lunch. Instead of going to Ortiz Port we went to Parola Port to get to Guimaras. Parola Port was used as an alternative entry point for Guimaras because of strong waves at Ortiz Port making it difficult for boats to dock and for passengers to board the boat. If I were to choose which one is better I’d go for Parola. Ortiz Port doesn’t look nice, looks very crowded and disorganised. At the port, we paid our tickets and waited for the 3pm boat to Guimaras. Boats here leave almost every 30 minutes and fare costs just 14 pesos. Shortly after we arrived at Guimaras and registered at the local tourism booth inside the port. Nothing much to see yet but the port looks organised and clean. A lot of construction was going on when we arrived, a sign of development in the area. We met up with Kuya Charlie, our tricycle driver and tour guide, he was referred to us by Kuya Gerald (his brother) who was already booked at that time. We started late in the afternoon so our tour was a little rushed but we managed to get the most out of every minute we have. It’s best to arrive in Guimaras in the morning so you have more time to enjoy the tour. We also did a quick stop somewhere along the way where you can see the vastness of the island. Excited over Mangoes, we stopped at a fruit stand along the road. To match our mangoes we also bought bagoong (shrimp paste). Yum! They also sell mango hopia and mango piyaya. This one I love! Our next stop: The Pit Stop Restaurant. What’s best to try here is their very own Mango Pizza. They also have Mango Ketchup to match your pizza. Family Size Mango Pizza – The Best! After having a great snack, we went straight to the Trappist Monastery. It was past 4pm already so souvenir shop was already closed. They sell Mango Jam, Guava Jelly, Pineapple jam, Mango Bar, Otap, Biscocho and Pulvoron. They have vast greenery in the area perfect for relaxation and meditation for those who want to stay overnight here. Before heading to our next stop we asked Kuya Charlie to take a picture of us. Our mode of transportation in Guimaras. Thanks Kuya Charlie! Land Tour costs 1200 pesos, thats 300 pesos / head. Somewhere along the way, we noticed an interesting view and asked Kuya Charlie to stop. We also stopped at Camp Alfredo to check their rates/facilities but unfortunately there is a minimal fee required for you to get in. This is an adventure camp at Brgy. Ravina, Sibunag, Guimaras, Nueva Valencia they have ziplines, high rope obstacle course, hanging bridge, campgrounds, cabins, tree house, trails, infinity pool and rappelling facility. At around 530 pm, we finally arrived at our last stop before heading to our hotel. The Guisi Lighthouse is an 18th century Spanish Lighthouse at the Guisi Point of Barangay Dolores in Nueva Valencia. It is known as Faro de Punta Luzaran and is the second oldest lighthouse in the Philippines. They close at 5pm but Kuya Charlie managed to get the key for us to get in. We also didn’t pay the entrance fee anymore. After sunset, we walked back going to our tricycle and travelled more than 30 minutes to get to Raymen Beach Resort. People were so hooked up watching TV at the reception area. This was the only time we realised the magnitude of the earthquake we experienced back in Gigantes Island. Right after checking-in we called our relatives to let them know we’re safe. Thank God! 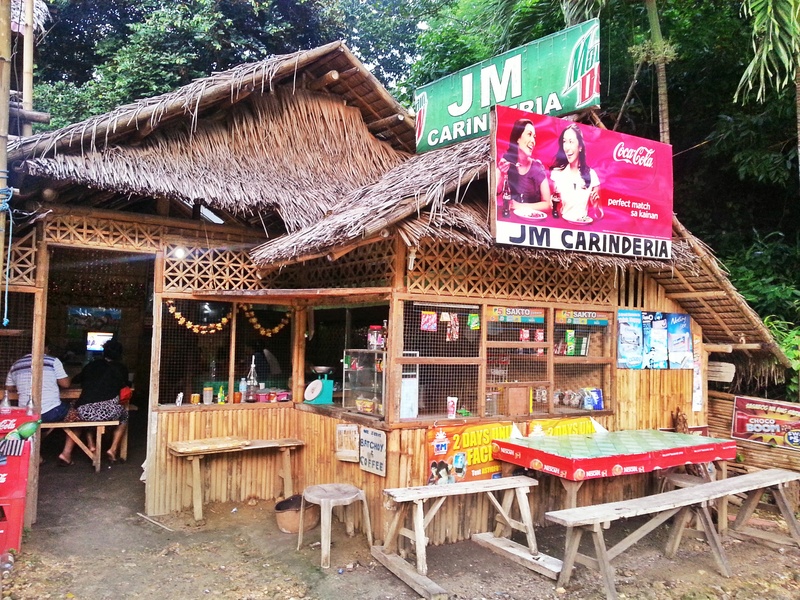 After check-in we went to JM Carinderia for dinner. I recommend you to eat here. You can ask what fresh catch they have and they’ll cook for it you right away. We requested the fish to be cooked as Sinigang and Fried and requested for Pork Liempo as well. It’s worth the wait I’m telling you. Yum! It was really delicious! Since the water was very calm and it’s still very early for us to sleep we went to the beach for a swim. The following morning we went back to JM Carinderia for breakfast before we start our Island Hopping tour. To arrange an Island Hopping Trip, simply speak to the receptionist of your chosen hotel/resort. Sometimes boatmen will also offer you the service while at the beach. For us, we arranged it at Raymen the day before. They have a flat rate of 500 pesos for the first 2 hours plus 150 pesos for every succeeding hours. To save, ask if you can join any existing scheduled trip that day. Lucky for us, 5 people shared the same boat making it less expensive. 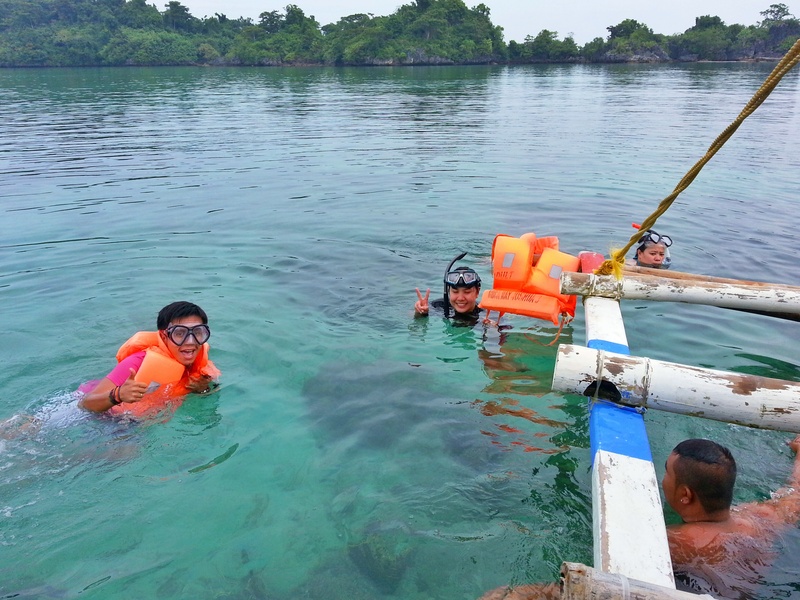 Right after SEAFDEC, we went to a snorkelling area just few minutes away. Sorry I don’t have an underwater camera to show you what’s underneath. On our way to the Turtle Sanctuary we saw these beautiful Islets/Rock formations. Finally we reached the Turtle Sanctuary. We expected many of them but there’s only one. Still lucky to see at least one of them. After seeing the turtle, we continued and circled the nearby islands. Most are privately owned now so all we could do was to just see them from the boat. Last glimpse of the beach before we left. After checkout we went to JM Carinderia for lunch. We really LOVE the food here because it’s not only good, it’s also not expensive so we didn’t have the chance to try the food at other restaurants. Maybe next time. Kuya Charlie picked us up at the resort to get to the port with few stops at the Pasalubong Center and Pit Stop Restaurant. It was a memorable experience with the randomest couple we have ever met. Thanks to Kuya Charlie for being nice. Goodluck on your studies! Back in the mainland, Flo and Lea took a cab going to Iloilo Airport. For us, instead of taking a jeep to get to the closest Biscocho Haus to grab some pasalubong we took a cab going to the closest mall to get new flipflops for my wife. For some reason it got cut off whilst in the boat from Guimaras to Ortiz Port. On our way to the mall, heavy rain started to fall making it impossible for us to walk around to get some pasalubong. Still raining, we took a cab going to Tagbac terminal. Not really sure of the last trip to Kalibo, we decided to be there early. We had a choice between a Ceres bus and UV express van but the van offered to bring us directly to Kalibo Airport so we booked for the van. It was almost 6pm when the van was about to leave when we realised we still don’t have the Butterscotch from Biscocho Haus. Oh my! We ended up buying Toasted Mamon right at the terminal. You might be wondering why we’re heading to Kalibo. It’s because we only bought our return tickets less than a week before this trip and Kalibo flight was the cheapest to get to Manila. We’re scheduled to return to Manila only 3 days after but I find it too short for the trip so I ended up booking for a later flight. So after 3 hours, we finally arrived at Kalibo International Airport. It was still early for our 330 am flight, we decided to look around to see if there’s any place we can sleep or stay whilst waiting and ended up staying at the Kalibo Airport Lounge in front of the terminal. The lounge is actually an airport hotel and restaurant being operated by Discover Boracay Travel & Tours. They have rooms and they also offer spa services and transport services. They also have waiting area similar to the airport boarding area. This is part of our Iloilo 5 Day DIY Trip last October 12 – 17, 2013. See detailed Itinerary and Expenses HERE. We came across your blog and we applaud your efforts to share your travel experience to the world. Like you, we are a dedicated team of travelers who feel that the world is vast, we need people to give us suggestions on where to visit, where to stay and what to do. Oceanislandtravel.com allows travel bloggers and individuals to post their comments, suggestions and advice to travelers and adventure enthusiasts. Our site is dedicated to less popular travel destinations that may websites overlook, but need the help to increase tourism. As a visitor to some of these destinations, we feel you can help promote their uniqueness to potential travelers. We would like to invite you to leave a comment on http://oceanislandtravel.com for any attraction, hotel or restaurant you may have visited on your travels. After posting a comment, visitors can click on your name and view your profile, which would have a link to your blog or website. That way, you can promote your blog, thus increasing traffic to your website, and help bring exposure to these overlooked destinations. We look forward to reading your comments and ratings! Thanks for confirming this! Case closed. 😉 Now I know what to say if I need fish sauce.